Drain tofu well. Crush it with a fork, add all the spices, the garlic, salt and pepper to taste and mix. Refrigerate for several hours. Heat the oil in a saucepan and stir fry the onions for 2-3 minutes. Add the tomatoes. Cover and simmer till the sauce thicken, than add the tofu. Peel the potatoes, cut them into 4-5 mm slices and cook. Let drain. 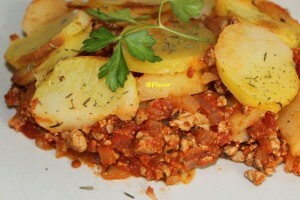 Put half the potatoes slices in an oven pan and cover with the tofu mix, spread evenly. Top the mix with the remaining potaoes slices. Sprinkle some dried thyme and brush with a little oil / tomato sauce to prevent it from drying. Bake until the potatoes are browned (20-30 minutes). Variation: instead of tofu you can use soya granules. Instead of potato slices you can use mashed potatoes . Creat de: fleur laSaturday September 21st, 2013.la11:25 AM.